Comments What makes this Ruby ring very special is the rarity. Much as we wrote in the last two years about the actual Ruby situation it went on the expected lines. Today sourcing costs have up by 40% and fine Mozambique Ruby is going the Burma Ruby way in terms of the prices. Today the price at which this piece has been sold is the sourcing price ( A detailed story on this would be done later this month with graphs and pictures of course!). 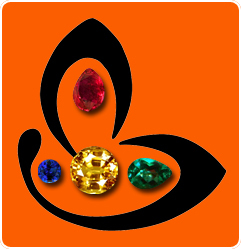 However may we add that once a gemstone is listed on Gemstoneuniverse the price never gets changed! Some of the individuals just because of the gems they bought got a 40% return on their investment one day one of the purchase. The way Ruby and Cat’s Eyes prices are spiralling we can expect another 30% increase in sourcing costs from September 2-011 to February 2012 unless new mines are discovered and supplies become regular. Those really interested in wearing a Natural Ruby for Sun should not delay in case price is a factor because prices shall definitely go up. The centre piece is a fine unheated Ruby with over 90% clarity from Mozambique with a vivid and vibrant red shade. It is flanked by tow 5mm accents rubies unheated from Tajikistan to make up the weight. The lustre and fire of these fine gemstones is so gorgeous that you can see the vivid red reflection on the ring shanks. 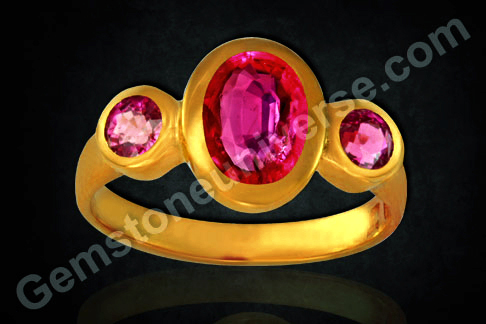 Saatvik, powerful, pure and royal all essential Sun attributes in this Natural Ruby Ring.